TOKYO – April 8, 2019 – Pre-registration opens today for LINE Chef, a new cooking game coming to LINE Corporation's LINE Games platform. 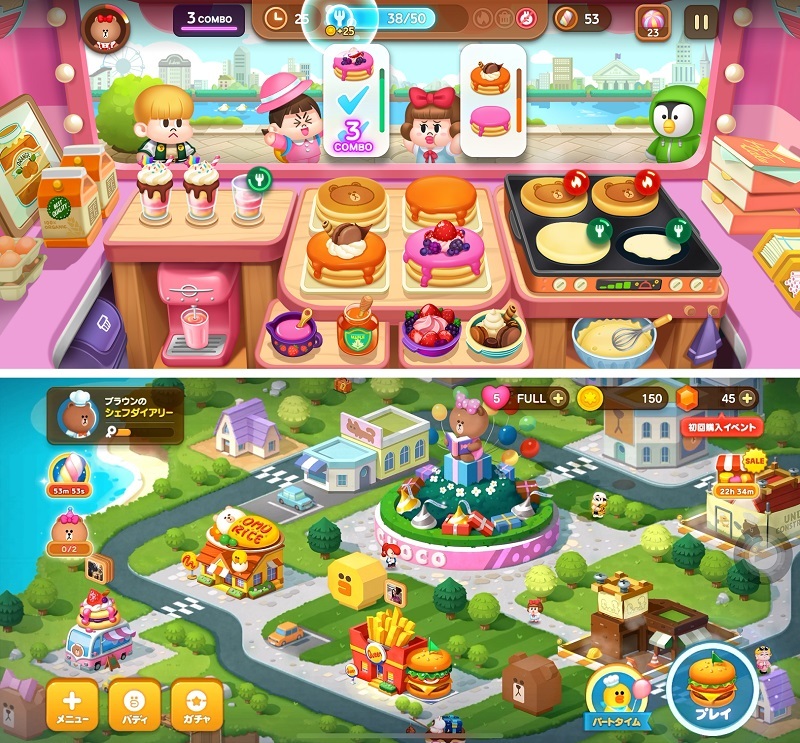 In LINE Chef, players become a chef alongside Brown and race to prepare, cook, decorate, and serve a variety of delicious dishes to customers. Completing the goal within the time limit will clear the stage. Take on dozens of cooking challenges, hone those skills, and become a master chef! Players will take orders, prepare, and serve meals to an endless line of customers. Completing the goal within the time limit will clear the stage and reward the player with coins. Using these reward coins to buy new cooking utensils and kitchen upgrades will make it possible to prepare even more meals at once. In the first set of missions, players will be tasked with cooking pancakes, omurice, and hamburgers, with more dishes on the way. From today, users can pre-register for LINE Chef. Coins and in-game items will be given out according to the number of people who pre-register, with rewards becoming more impressive as more people sign up. These items will be given to all users who log into the game after its official release. On top of this, two more campaigns will also launch today—one which gives up to 3,000 users a chance to win a small gift, and a social sharing campaign that offers in-game item rewards. Users who friend the official LINE Chef account (LINE ID (Japan): @ LINE_Chef_JP) will be entered into a draw for a coffee coupon or a Mister Donut gift ticket. Up to 3,000 users will have a chance to win, with each person eligible to win a maximum of three prizes during the campaign period. All users who friend the account will receive an original LINE Chef wallpaper. Coins and in-game items will be given out according to the number of people who pre-register during the campaign period. Items must be redeemed within 14 days after the game's official release date. 1. Friend the official LINE Chef account (LINE ID (Japan): @ LINE_Chef_JP). Blocking or unfollowing the account will void the pre-registration. 2. Tap "Pre-register" on the game's page on the Google Play store. By pre-registering for a game, users can receive a notification when it officially launches. Pre-registration for the App Store will be available in the near future. From the official LINE Chef account (LINE ID (Japan): @ LINE_Chef_JP), users can share the game with their LINE friends and receive in-game items. The item given will depend on the number of shares. LINE Chef and Fujiya's beloved mascot, Peko-chan, will come together in a special collaboration. Stay tuned for more details. Under its corporate mission "Closing the Distance," LINE Corporation will continue to develop a variety of engaging and innovative content through LINE Games and its other services to bring users even closer together. Android and Google Play are registered trademarks of Google LLC. iPhone, iTunes, and App Store are registered trademarks of Apple Inc., registered in the United States and other countries. All information is true and accurate at the time of publication, and subject to change without notice.